Book Review: Singing and making Music – Called. Convicted. Converted. I have read my fair share of books on ‘worship music’ and music in general within the Christian sphere, many of them are written arrogantly, reflect bad scholarship and a weak understanding of music (everyone thinks they are an expert when it comes to music), it is because of these things that ‘Singing and Making Music’ by Paul S. Jones is a breath of fresh air into the turmoil of the ‘worship wars’. Written very humbly, and not setting out to fix all problems, Jones does in fact remedy core issues with regards to church music, he does a lot more than the meekly worded preface sets him up for. 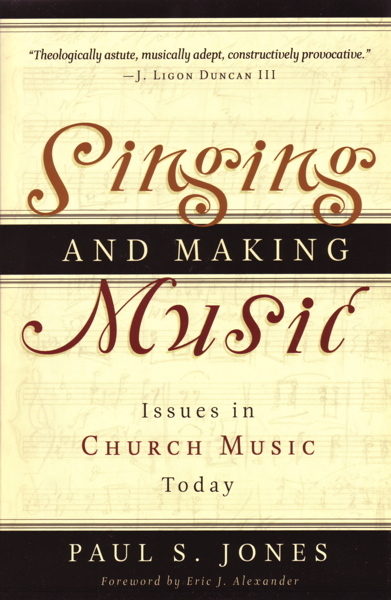 Written in a scholarly fashion, by someone who holds a doctor of music degree as well as undergrads in Bible, performance and composition, ‘Singing and Making Music’ is a must read for all elders, musical directors (‘worship pastors’) and musicians in churches that are eager to think biblically and astutely through the issues surrounding church music. The book is broken up into four different parts, namely: Corporate Worship; Hymnody and Psalmody; Issues; and Composers and Compositions- with two very helpful closing appendixes. Under ‘Corporate Worship’ Jones deals with many issues, from clapping after a performance in church to the vastness of King David’s praise team (some 4000!) to the issues of authenticity in corporate worship. In the section on ‘psalms and hymns’ Jones works very helpfully with the issues of hymns and psalms in the modern context, including a very helpful chapter entitled, “What Psalm Ascriptions Tell Us”. In the ‘Issues’ section new ground is broken and questions asked (at least for those of us not exposed to them) that add new dimensions to the discussion in evangelicalism, things like where church musicians should be paid or not (don’t throw this issue out till you have read it! ), what can small churches do to improve their music, common misconceptions about church music etc. The final part of the book is where those with some music knowledge are really able to appreciate the work put in by Jones, while some of that section is lost on a lay-person (though not all, there is much to learn there) musicians will benefit from it immensely. This book is appropriately provocative on worship matters, it serves its purpose of being an aid to pastors/elders and church musicians excellently. What I have most appreciated it its thoroughly biblical nature and handling of issues surrounding worship music, Jones does not make (as far as I can see) unfounded statements and leaps of logic to push his agenda, he does not merely ask a whole litany of questions without offering real advice and applications to situations. If you are serious about working through the issues of worship, or just growing in your thinking, this book is a MUST read! Jones style of writing makes for easy reading, his thoughtfulness makes for a thorough examinations of issues, it is by far my book of choice when it comes to worship music, I can’t think of no other book on the issue that comes close to be as helpful as ‘Singing and making Music’, not only to think through the theoretical issues of worship, but also to deal with the practical issues that would improve your churches worship music and liturgy. Did you get it at Augustine? Hey Renate, it will be worth the read. Augustine has ordered them so keep an eye out.